A motor repair garage in Edinburgh during the 1930s. Homepage. This page: A letter sent by G.C. Macandrew advising a customer that their Hudson car part is available. Gordon C. Macandrew & Company. This letter dates to 2nd July 1937, and was issued by Gordon C. Macandrew, a motor car repairs and sales agency situated in Edinburgh during the 1930s. Their head office was at Lauriston Gardens, and they also had premises at 86 Lothian Road. 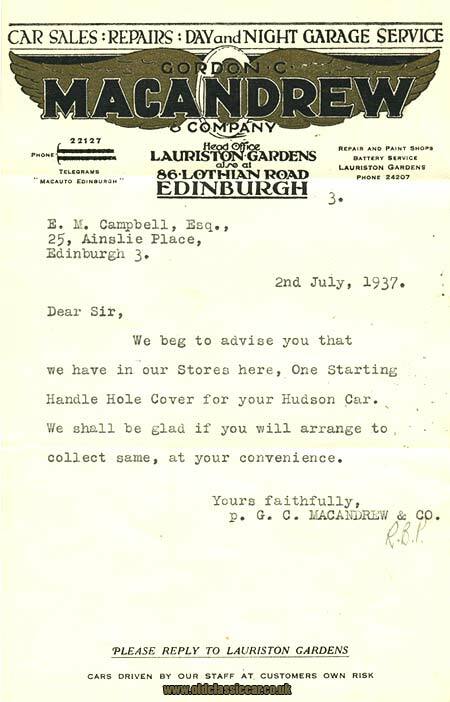 The letter was sent to a Mr E. M. Campbell, of Ainslie Place, advising him that the Starting Handle Hole Cover, that they had ordered for his Hudson motor car, had arrived in their stores and was awaiting collection. Mr Campbell had two ways of contacting the garage, other than visiting in person - he could either telephone 24207, or send a Telegram to "Macauto Edinburgh". The illustration at the head of the letter is very smart, showing a winged wheel not unlike that seen at the Indianapolis Motor Speedway in the States. Macandrews offered car sales, plus day and night vehicle repair, along with a paint shop and a battery service, handy if you had to resort to a starting handle on a regular basis with your car. A search online brings up a few details of this old garage business. It would seem that the full address for the premises was 13 Lauriston Gardens, the design for the building handled by architect John Ross McKay in 1930. Whether the building still exists or not I don't know. I did find a reference to a current business of this name still operating in Edinburgh, but now at Queensferry Road rather than Lauriston Gardens. Details of early planning permission requests for the 86 Lothian Road address also turned up with a little digging, but again as yet no photographs, either current or from the 1930s. Return to the Motoring Collectables section for more items of interest to vintage and classic car enthusiasts.